Through its Home of Innovation growth initiative, Sabic has announced strategic marketing relationships with 40 global, regional and local manufacturing companies, including 3M Saudi Arabia, to promote the introduction of industry-leading technology into Saudi Arabia and the Middle East region. "We look forward to collaborating with these companies to seek cost-effective, high-performance solutions that meet customer needs and increase demand for the design, manufacturing and purchase of new products in the kingdom," says Awadh Al-Maker, executive vice president, technology and innovation, Sabic. "At 3M, we are excited to collaborate once again with Sabic and thus contribute towards the introduction of industry-leading technologies into the Saudi market and the wider Middle East region," says the managing director of 3M Saudi Arabia. "We have a prolonged relationship with Sabic which goes beyond the inception of the Home of Innovation programme and together over the years we have developed a set of unique products that have helped enhance protection in workplace and improve productivity." "Saudi Arabia is at the core of our growth strategy and we have been actively pursuing opportunities in this market to build our local capabilities, especially in manufacturing and technical aspects of our business," says Hammoudeh. "Our state-of-the-art Innovation Centre in Riyadh has been acting as a perfect platform for various industry professionals to engage and learn about our latest technological advancements in their respective fields. Built on its tremendous success, we will soon be opening a new Innovation Centre facility in Dammam area, specifically designed to serve companies in the oil and gas industry and provide them with latest innovative solutions and technologies." "Sabic is committed to enabling downstream industry development in the kingdom and region, and Home of Innovation provides a unique platform to engage the local market," says Tymon Moore, marketing director, Middle East & Africa at Sabic. "We look forward to exploring long-term, mutual growth opportunities to help advance the local and regional economy." Participating companies self-selected among three engagement levels – Leadership, Performance and Programme – which afford varying degrees of regional exposure, business opportunities, industry connections and market insight. The Leadership level currently includes Harwal Group of Sharjah, United Arab Emirates, New Products Industries Corp. (NEPRO) of Jeddah, Saudi Arabia, Philips Saudi Lighting of Riyadh, and Schneider Electric of France. 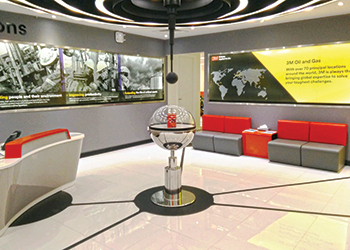 3M is among a group of companies at the Performance level, which also includes ABB, AlWasail Industrial Company, Arabian Gulf Manufacturers (AGM), Badger Meter, Geberit, Honeywell, Kawakita Denki Kigyosha (KDK), Kohler, Miele, REHAU, Riyadh Cables, Saft, Samsung, and Watts Industries. The Programme level currently includes AlBarakah Company for Industry, Al Jazierah Home Appliances, Future Building Systems (FBS), Grundfos, Legrand, Leviton, Manik, Middle East Fiber Cable (MEFC), Panasonic Eco Solutions and Pentair.